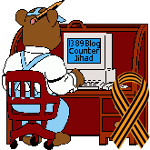 flame war — 1389 Blog - Counterjihad! Whatever happened to healthy disagreement? Charles Johnson, your fifteen minutes are OVER! CAIR bullies CBS into dumping a Christian talk show host?! Let them know what you think!